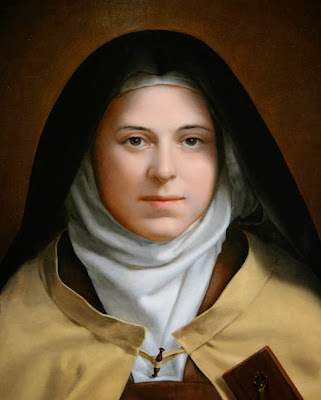 Today we celebrate St Therese and are thus reminded that it takes all types of saints to make up the Body of Christ. She is a virgin and mystic. Therese in her cell in Carmel rejected the world for the love of Christ. She loved and studied nothing but Scripture in the end. She endured great hardships of the ascetical life and she endured both great darkness and great radiance in the love of Christ. This is the lesson to all who would follow Christ, that as we walk that golden path our individual lives begin to transcend the times and cultures in which we live. We begin to grow into something deeper, wider and more magnificent than the spirit of the age or our own circumstances, family background and personality. We are caught up. We participate in a greater glory and a greater truth. Our little lives are magnified and we mature into something and someone greater than we ever imagined. As we grow into saints–grow into the person God created us to be–grow into the fullness of the stature of Jesus Christ. As this process takes place we also grow out of ourselves and yet into our true selves. The little person we were dies and the greater person God created us to be begins to take shape. As this happens we find a fulfillment and completion in all the saints. The innocence and child like character of Therese blossoms in our lives. All we need to do is stay on the path and keep our eyes on Jesus–who is the author and finisher of our faith.